My blanket always worked as an impenetrable shield of invisibility when I was a kid. Too bad it doesn’t still work that way. It would be a convenient way to remove myself from boring meetings at work. All their new assignments would bounce off of me and land in the trees outside the conference room window. Do crows know how to use photoshop? Hmmmm….Yep, that room looks pretty sound to me. I should’ve hired Biff when I was a kid. Blankets always were a nice shield. they covered your entire body and magically kept all the creepy monsters under the bed where they belonged. Biff the Younger® definitely does not play around with such serious security breaches. Though if he handles the monster in the closet like that, I shudder to think how he’d approach bigger otherworldly threats. Ghostbusters on neutron-laced crack. Protective blankets ftw. Also, blanket + flashlight = sneaky staying awake overlate for rebellious reading. @Kurast: I’m pretty sure by now that you don’t read other people’s comments. But still…where did you get your nickname from? its a really lucrative market. I love Biff’s star sheets. Looks like Biff the Younger’s got the under-the-bed sorted nicely, too. But why does his star-spangled mattress bring to mind a slab of concrete…? Also, I’m starting a drive to assist Izual Shima in his search for truth. I propose that all of us end our posts by petitioning Kurast for the origins of his forum handle. Are you seriously trying to tell us that Biff doesn’t know how to monster-proof office cabinets? I must cocoon myself in my blanket or I can’t relax enough to fall asleep. Maybe it’s from my “afraid of monsters” stage. Even on really hot nights, I still – at the very least – have my feet burrowed in a blanket. That was a different thing Andore Mordre. The Gungerlock was a pet. I love little Biff. He’s so cute. Did he ever have a different clothing style? Maybe in old age he will. 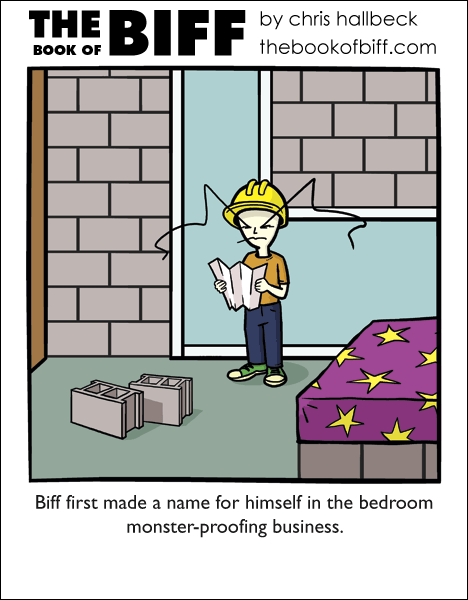 Biff the Younger-Keeping you safe from the monsters in your closet and under the bed since 1980. And the people have spoken.We demandth a Biff the Older. Ideas that worked as a kid but not so much as an adult, week? Did you happen to grow up on Traal, by any chance? Wait did Chris just prove there are multiple Biffs? Also the monsters i faced as a child were much to advanced for Biff they could pass right though solid objects! Hmmm…. I wonder if this is how he amassed his fortune, selling Monster and Babysitter proofing for a house as a kid. Now all we need is TeenBiff. I wish i could sell my younger brother and replace him with KidBiff, hes soooooo adorable!